No surprise Native Wildflowers Lap Quilt Wall Hanging is one of my favorites. These brand new, imported quilts feature very detailed garden friends and detailed applique flowers - can you identify all of them? Native Wildflowers Lap Quilts also have several places where you can easily embroider someone's name and special date to make these into personalized gifts. 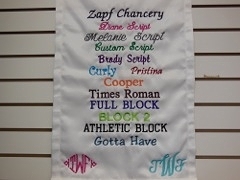 In photo examples, the customer wanted adjectives to describe a relative so they were scattered around the inside border of the quilt with a special dedication at the bottom. 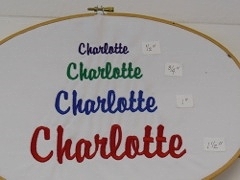 The cost of this custom embroidery work was around $250. Native Wildflowers Lap Quilts have a soft green background and are cotton fill finished with hand quilting.